Goal for today: Scan for errors & make sure all visibility settings are Green for the focus page. Start tracking your rankings on Google. These will be the most important things to achieve today. They will ensure your Focus Page has a solid chance of getting ranked. 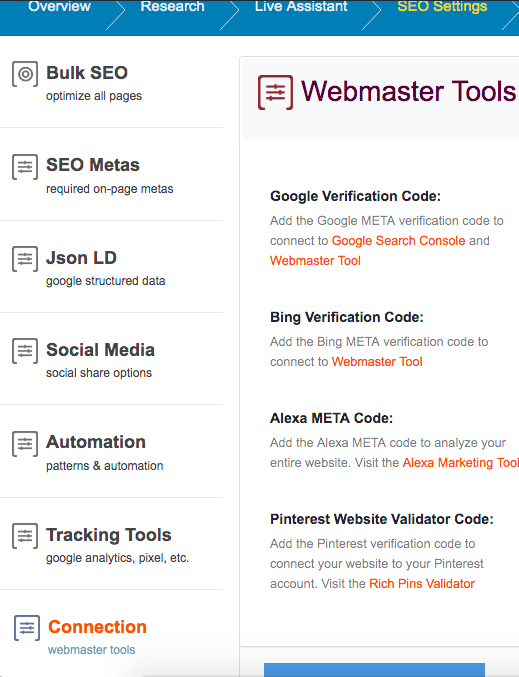 Integrate with Google Search Console and get it to index your entire site. This first part of Day 4’s recipe is to help those who couldn’t complete this part yesterday. You’ll easily place this in your Squirrly SEO. Go back to Google Search Console now. It will load their tools for verification. Great! GSC has now verified that you own the website. Before throwing a really big party about all this, make sure you look at the domain’s URL in your browser and in your Google Search Console. Make sure they are the SAME !!! That is a huge problem. It doesn’t seem like it, but will cause you problems way beyond these first 14 Days of your Journey to Better Ranking. In today’s recipe, I’ll give you a quick fix for this (in case you are not a developer, this is the best FIX you can have in place). 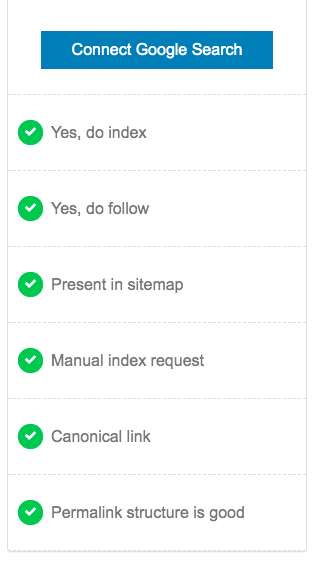 Next Step: request a full index of the pages on your website. Sometimes, something as simple as this will help your pages in search rankings. Great! Now Google starts looking at the pages it should index. This helps your online visibility. Reduce http vs https Errors and future ranking drawback. Get the free WordPress plugin here. Remember: it’s a third party plugin, not made by us. However, we’ve been using it successfully on a couple of websites. And it works great for us. Just install and then activate the SSL feature. You can check some of the things they say if you want, if you’re having some super special settings in your WP environment, but we’ve always just activated and it caused no problems. From now on, you won’t have http vs https errors which is important for Google. You can see how to do it in this video. Just add the keyword for your focus page, so that Squirrly SEO will start tracking its position on Google. Since this is the 14 Days Journey to Better Ranking we should start tracking this now. To see that it will increase over the next few days. Now, let’s make sure you start this the right way. Since you’re taking the 14 Days Journey to Better Ranking, it would be really great if you could see the position that you currently have in Google for your main keyword and this focus page. (the focus page you’re using for your 14 Days Journey, which you finished identifying yesterday). 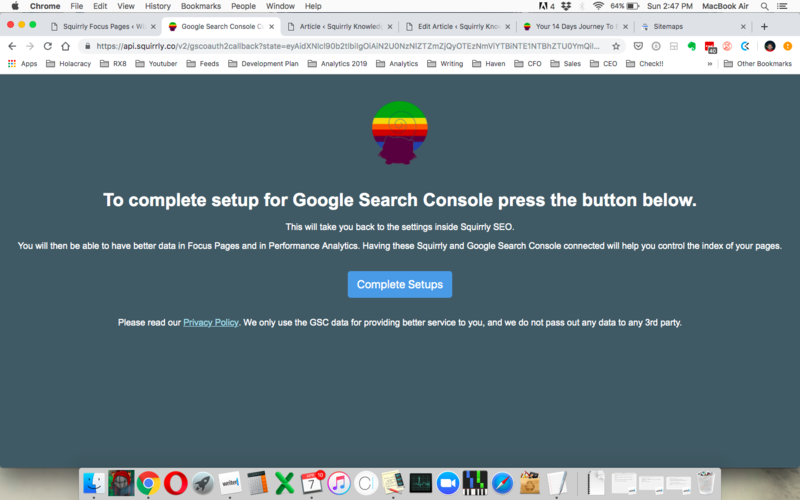 Google Search Console (GSC) and its integration with Squirrly SEO will start displaying ranking positions inside the Rankings feature of Squirrly SEO, if you perform the steps from the video I’ve linked to above. However, Google is the one controlling the data inside GSC. Since it’s Google as a search engine and Google as the maker of GSC, Squirrly SEO can’t force GSC to do anything, since it’s not software created by us. Google doesn’t always send data that it knows about to GSC. Sometimes, because your site is either very new on the web, or hasn’t been integrated with GSC before, then Google will take a LOT of time (sometimes two weeks, sometimes two months) to start displaying a lot of data and a lot of keywords. Your WordPress site could be found online for 200 keywords already, yet GSC might show that you’re only ranking for about 10 of those 200. ^^ yup. That’s how it goes, even though sometimes it really has a lot of data. Because we want to see you succeed during this 14 Days Journey to Better Ranking and since we’re already sponsoring you and covering many costs ourselves (read more here), we’ve decided to change something. Our JourneyTeam community on Facebook opened our eyes to Google’s problems with Google Search Console and they felt a bit sad, because they weren’t using any third party SERP Checkers to track their rankings. Therefore, we’ve decided to UP our sponsoring game for all of you who take this Journey. Due to feedback from our community, we’ve made a super easy way to turn your Squirrly SEO Account to the level: “Business Trial” for 14 days (we’ve made it 14 days after feedback, so it can match the time of your Journey) !!! Completely for free. 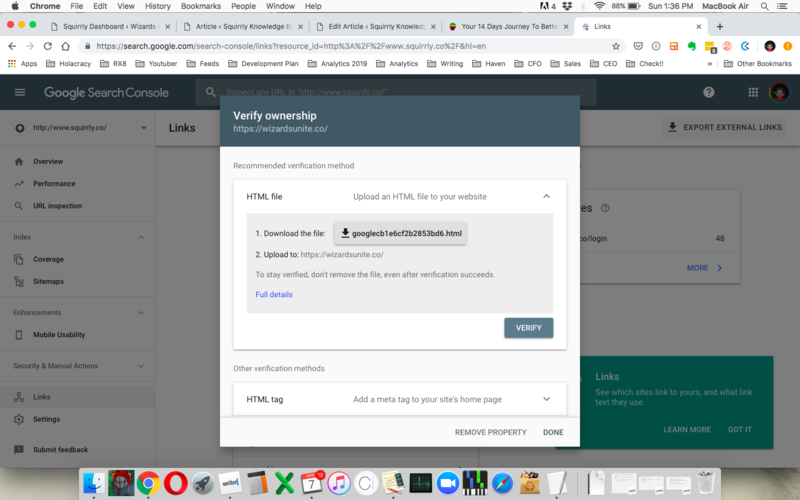 And the best part: once the Business Trial is done, your account gets automatically reverted back to PRO or FREE, as if nothing had ever changed in your Squirrly SEO account. You have zero work to do to make that happen. Completely stress-free. Once the time is up, it simply goes back to what you had before. WordPress – Squirrly – Dashboard – Profile (it’s a button at the right sidebar). It takes you to my.squirrly.co. There you will find a button to start this stress-free 14 days trials of Business Plan. Remember: this is not mandatory! But if you do it, you WILL get to see the exact and 100% objective position that your focus page has on Google right now for your main keyword. You can use it while you’re taking the Journey and then let the plan be reverted back to what you had initially. Note: you can start the Business Plan if your are Free or PRO. These were the mini-goals in today’s recipe. Let’s move on to the real goals for today. Go to WordPress – Squirrly – Dashboard. For the website I’m using there are no SEO Issues at the moment. Remember: due to the nature of WordPress, SEO issues will appear in time! It’s almost impossible not to encounter errors over time. This feature scans everything in the background from time to time. However, this is Day 4 and we need to make sure you’re well on your way to Better Ranking for the focus page you’ve chosen. It will run a new test and tell you if any problems were identified. If problems show up, look for the button which opens up explanations on how to fix the problem. This is the final item on today’s list. Look the the Visibility Column. It should be green, but if it’s not, then it’s 100% important you fix this asap, to ensure success for your 14 Days Journey. You will see the visibility issues that it checks for. Some of the biggest reasons for why people can’t rank websites are related to the fact that they don’t pay attention to these elements. Without having all these elements colored Green, your page has no chance of ranking. You can click on each item from the list, to see the related task. In my case, even though everything is green, Squirrly SEO tells me that I still have to connect my Google Search console to Squirrly SEO. Choose the account (the Google search console account). Then you’ll get to this panel. Click on the Blue Button to finish setup. It will take you back to your WordPress site’s dashboard. Hit refresh in your browser. Now, Focus Pages will start showing you Impressions and Clicks and CTR coming from Google Search. In your Focus Pages section, scroll to the right of the screen and you will see them. This was all for today. You have a better idea about what you should achieve and you’ve integrated your Focus Page with your new SEO Strategy. You know what you’re after and you have plenty of good ideas for after you complete the first Journey. Maybe you even made a couple of re-iterations, and even adapted your strategy already. I know some of you have. You’ve researched. You’ve finished your setup. And with today’s work, you ensured there will be no massive blocks standing in your way to Better Ranking. Also, you’ve told Google to pay attention to your website and your 100% optimized Focus Page. These were the most important aspects which revolve around Focus Pages success. If any of the items you’ve worked on in the first 4 days were left to pure chance and random luck, you wouldn’t have had real chances of success. Next, we’ll work on factors that make Google fall in love with web pages, find value in them, and rank them higher in search result pages.